World-renowned astronomer Carl Sagan once said, “Somewhere, something incredible is waiting to be known.” Community college photonics and optics programs are preparing students to find it. About 30 community colleges around the U.S. produce approximately 250 to 300 photonics graduates annually. Some go on to further their education in undergraduate degrees and beyond, while others earn their associate’s degree with plans to enter the workforce. The latter group is filling a void currently felt in the photonics and engineering workforce — an estimated 800 new technicians are needed around the country each year, according to the National Science Foundation’s National Center for Optics and Photonics Education (OP-TEC) in a 2012 survey of photonics and optics companies. 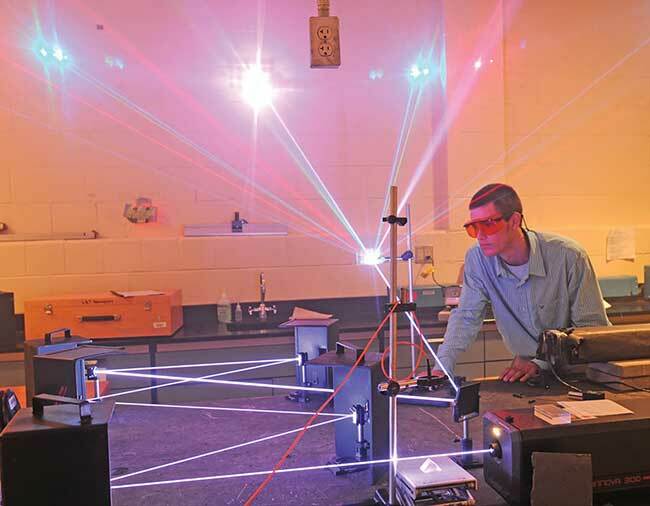 John-Kevin Frazee demonstrates how an argon-krypton laser can be used in light shows while a student at Central Carolina Community College in 2012. Such programs are preparing students for the workforce, as well as continuing education. Courtesy of Central Carolina Community College. Resources such as the U.S. Department of Energy Office of Science Early Career Research Program are supplementing research- and workforce-ready education. SPIE offers education and training, as well, in areas such as biomedical optics and medical imaging, illumination and displays, lasers and sources, nanotechnology, optical design and engineering, and solar and alternative energy. 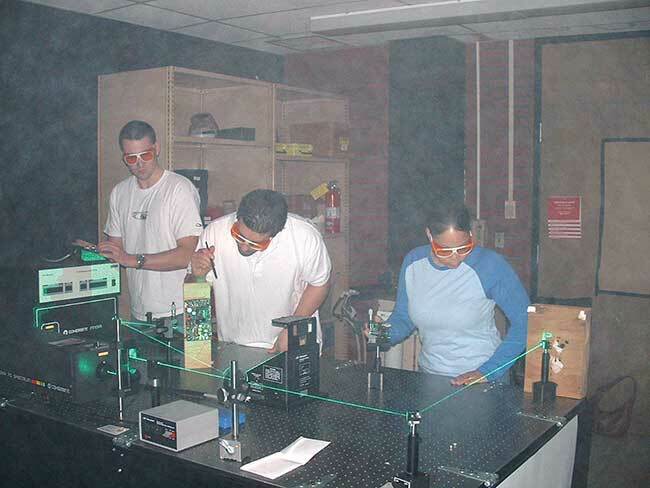 Students at work in the Laser Electro-Optics Technology Program at Springfield Technical Community College. Courtesy of Springfield Technical Community College. Photonics Spectra spoke with educators from several community college photonics and optics programs about courses and training they offer, and for their take on the importance of these programs. • Nicholas Massa, a professor in the Laser Electro-Optics Technology Department at Springfield Technical Community College in Springfield, Mass., and a principal investigator for the U.S. National Science Foundation’s PBL Projects: Skills for the 21st Century. • Jacob Longacre, an assistant professor of Electronics Engineering Technology at Quinsigamond Community College in Worcester, Mass., who runs the school’s photonics program. Jacob Longacre, an assistant professor and leader of the photonics program at Quinsigamond Community College in Massachusetts, works with students in an electronics class on troubleshooting amplifier and power supply circuits. Courtesy of Quinsigamond Community College. • Alexis Vogt, an associate professor of optics and chair of the optics and photonics program at Monroe Community College in Rochester, N.Y.
• Bob Ballard, a Fiber Optics Association (FOA)-certified master instructor at BDI DataLynk LLC, a Lago Vista, Texas-based company he owns. BDI is partnering with SUNY Westchester Community College in Valhalla, N.Y., to provide FOA-sanctioned fiber optics network certification courses. Photonics Spectra: What are the most popular areas of study within your school’s optics programs — which courses do students really get excited about? Massa: Students in my program enjoy the hands-on problem-solving courses the most. These include the Advanced Topics in Lasers course where students work in teams to solve real-world industry problems. These problem-based learning scenarios, called PBL Challenges, are presented in a multimedia format and are available through the New England Board of Higher Education’s Problem-Based Learning Resource Center. Above all, however, students enjoy the Senior Projects in Lasers course the most. In this yearlong capstone course, the majority of students work on real-world industry-sponsored projects under the guidance of an industry mentor. Many of these projects are conducted on-site at the company and some are actually paid internships that lead to employment upon graduation. Through this course, students get to experience what it is like to actually work as a laser technician alongside engineers and scientists before graduating, which has a tremendous impact on their motivation and learning. Some of the innovative projects students have engaged in include building a commercial-quality scanning fiber laser marking/etching system, a frequency-doubled green fiber laser, a hybrid solar/compressed air engine vehicle, and many others — all industry-sponsored. 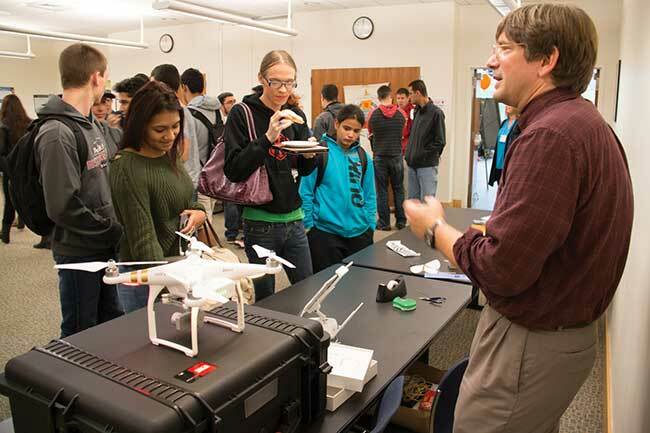 A Manufacturing Day presentation last year at Quinsigamond Community College in Massachusetts allowed Jacob Longacre, an assistant engineering professor at the school and leader of its photonics program, a chance to talk with students about the integration of optical, electronic and aerodynamic technologies exemplified by drones. Courtesy of Quinsigamond Community College. Longacre: Our program is very new, so our data-set is limited, but 3D imaging is an area that generates a great deal of excitement. The students recognize the impact that 3D imaging will have on applications they are familiar with, such as movies and video games. The students can also identify some of the issues with these technologies, and see how they cross into multiple areas, including optics, electronics, mechanics, psychology, etc. Vogt: The Optical Systems Technology program at Monroe Community College (MCC) was established in 1963 as the first school in the nation to train technicians to work in the optics industry. Our program remains the only community college in the country awarding associate degrees in optics. In 2015, close to $1 billion was awarded to the optics, photonics and imaging sectors in the Rochester, N.Y., region, and our optics program has seen enrollment numbers rise as a result. Students are interested in pursuing a course of study where employment opportunities are abundant, and in Rochester we currently have more job openings for skilled optics technicians than we have graduates to fill the jobs. Enrollment in our Introduction to Optics course, for example, has doubled from last fall. Over 50 percent of a student’s time in our program is spent in a laboratory environment. Students leave our program with hands-on skills that prepare them for the optics and photonics workforce. The MCC Optics & Photonics program is designed for both career placement, as well as 2+2 transfer opportunities. We provide a two-year Associate of Applied Science (AAS) degree, with a track in traditional optics and a second track in photonics, a one-year certificate and a 2+2 program where a student spends two years at MCC and then transfers to a four-year college to complete a bachelor’s degree in optics at the University of Rochester or Imaging Science at Rochester Institute of Technology. We have students excited about and enrolled in all three paths. Ballard: A well-trained fiber optics technician is in demand in today’s vast telecommunications job market. A fiber optics technician maintains fiber optic cable systems that carry both analog and digital transmissions. Fiber optics technicians are responsible for installing, testing, troubleshooting and maintaining optical fiber cables that are used in sending and receiving communications data. These trained technicians splice and fuse fibers, and install cables beneath the ground and in conduit, and in the various areas of building structures. The Westchester [Community College] Certified Fiber Optics Training program prepares the student to take the certification exams, which are offered immediately after each course. Each exam is sanctioned by the Fiber Optic Association (FOA). The FOA is an international, nonprofit organization that certifies fiber optic technicians, approves fiber optic technician training courses and participates in the development of standards for the industry. Available courses [in this program include] Certified Fiber Optic Technician (CFOT) Basic Course, Certified Fiber Optic Specialist/Testing & Maintenance (CFOS/T), and Certified Fiber Optic Splicing Specialist Course (CFOS/S). PS: What is some of the innovative work these students and their instructors are doing? Longacre: The most innovative work has been coming from the courses … that have students apply what they learn to design and build things. Students internalize the information more effectively, but they also learn how things work in reality, where the structure, sensors, actuators and electronics all have to work together. A great concept can fail for some simple reason like binding hinges. This also introduces students to concepts like testing designs or subsystems quickly and cheaply, then learning from failures to iteratively improve the overall design.? 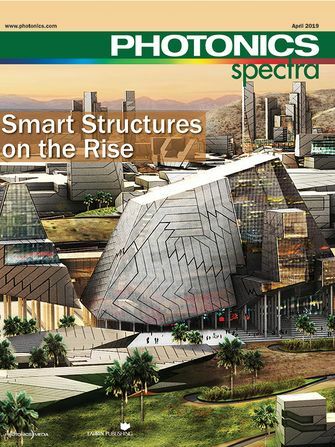 Vogt: Optics and photonics continue to be innovative fields with new advancements daily. At MCC we bring these innovations into our classrooms and labs through curriculum, state-of-the-art equipment and visits to area optics companies. All of our students visit multiple optics companies before graduating to see the innovation ... in Rochester. Most of our students participate in paid summer internships to learn about this innovation firsthand. Ballard: All of our courses provide comprehensive lecture sessions followed by detailed hands-on sessions including installation, testing and troubleshooting techniques, not only utilized throughout the fiber optics networking industry, but also approved and sanctioned by the FOA. Hands-on sessions represent real-life scenarios offering challenging scenarios, which enable all students to practice repair and troubleshooting techniques learned during class. Massa: In our program, we try to emphasize practical hands-on applications of optics and photonics. While we provide the theoretical underpinnings of the science and technology of lasers, optics and electronics, everything we do is intended to provide graduates with solid technical skills, as well as problem-solving, critical-thinking and teamwork skills. We are very lab-intensive and have state-of-the-art facilities that give students hands-on experience with the latest technology. Students receive extensive hands-on training [in] lasers, optics, fiber optics, holography, interferometry, electronics, 3D design using SolidWorks, LabView and much more. In fact, just this past spring we were awarded a $500K grant from the Commonwealth of Massachusetts to develop a new laser materials processing lab with several high-powered fiber and CO2 laser cutting and welding systems, as well as the latest optical test and measurement equipment. A group of technicians, engineers and scientists validate the performance of the High Contrast ARC Front End (HCAFE) AFECT (ARC Front End Compressor Table) system at the National Ignition Facility at Lawrence Livermore National Laboratory in California. Courtesy of NIF. PS: What advice would you give a new student entering the school’s optics programs, about the work ahead of them and their career options? Massa: You don’t have to be a mathematical wizard to be successful in the laser field. If you like science and technology, have a willingness to learn and think outside the box, and like to build things, you will be successful in the laser field. Intellectual curiosity and an entrepreneurial spirit are the only prerequisites. Longacre: The field of photonics covers a wide area. Find your area of interest and apply what you learn to it. Courses and jobs that do not fall exactly into that area will still provide applicable knowledge. Recognize that the world does not operate cleanly within specific majors or fields of study. Develop a framework for yourself to understand how disciplines relate and complement each other. Then you can use all the tools available, not just those traditionally associated with your interests. Ballard: Prerequisites for our basic, three-day CFOT course, as well as all of our courses, require that the attending student be able to read and write the English language fluently and be able to see and identify small tools. Because of the bandwidth demand throughout the data/telecommunications industry, many employment opportunities exist. From opportunities in the fiber to the home market with companies such as Google, Time Warner, and Verizon, to employment opportunities in the Local Area Network (LAN) infrastructure industry, fiber optic technician employment opportunities are growing around the world. Vogt: At MCC we prepare students to enter the workforce as skilled optics technicians and we also prepare students for advanced education. The opportunities for students upon graduation are numerous. We currently have more job openings than we have graduating students. We are here to help students succeed and to grow the optics workforce. The optics and photonics fields are at the forefront of future technological advancements and we welcome other students to join our program. SUNY Westchester Community College is currently developing a new photonics program within its Electrical Technology discipline to address the Northeast region’s increasing demand for technicians in the workforce. It’s widely known that the optics and photonics workforce is struggling to find quality technicians. A 2012 industry survey by the National Science Foundation’s National Center for Optics and Photonics Education (OP-TEC) found that an estimated 1,500 new technicians have been needed nationwide each year. Initiatives to address this challenge are popping up across the country, giving optics and photonics companies new hope for future workforces. 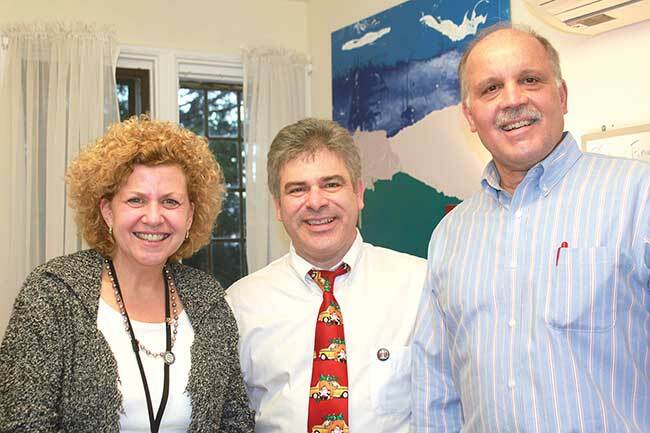 (left to right) Westchester Community College’s Laurie Miller McNeill, Kyriakos Ioannou and Stephen J. Leone are now working to develop a photonics program at the school to assist in growing the industry’s workforce. It will be the first such program among two-year colleges in the Northeast region. Courtesy of Kyriakos Ioannou/WCC. Among such initiatives is a new photonics program currently in development at Westchester Community College (WCC) in New York, part of the State University of New York system. This new program aims to educate and train students for roles that should ultimately help fill the technician gap. Ioannou is joined in this new photonics program venture by Stephen J. Leone, program administrator at WCC, and Laurie Miller McNeill, the school’s director of Institutional Advancement. The WCC survey also gauged companies’ interest in partnering with the school to create such a program. A number of the survey respondents noted they will be hiring photonics technicians within the next five years. And several other companies said they would consider assisting local education efforts in optics and photonics technology at the middle school, high school or community college level. 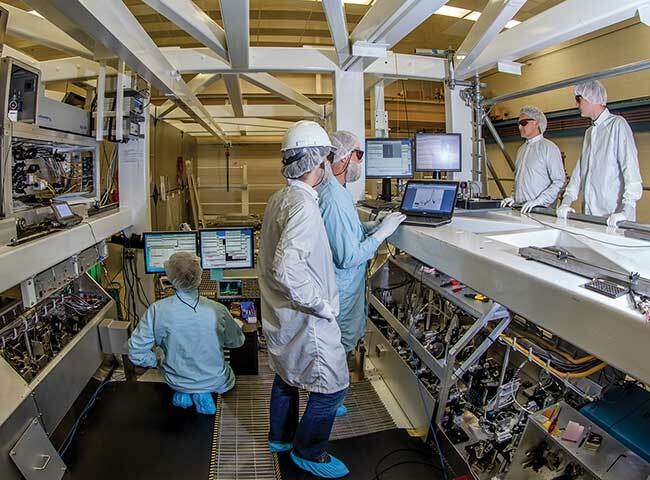 WCC offers programs in various engineering technologies, with strong industry partnerships in those areas; the new photonics program will be an extension of that, Ioannou said, into the growing photonics field. The new photonics program will begin with the option for Electrical Technology students to concentrate specifically in photonics. WCC does not currently offer any photonics or optics classes, per se. But there are some components of these fields included in several Electrical Technology classes. Existing courses in this discipline will be modified to introduce the new photonics component, according to Ioannou, and will also prepare students for more advanced photonics classes that will eventually be available. In addition, WCC is working with OP-TEC to develop a Fundamentals of Light and Lasers course that will be followed by a Laser Systems and Applications class. 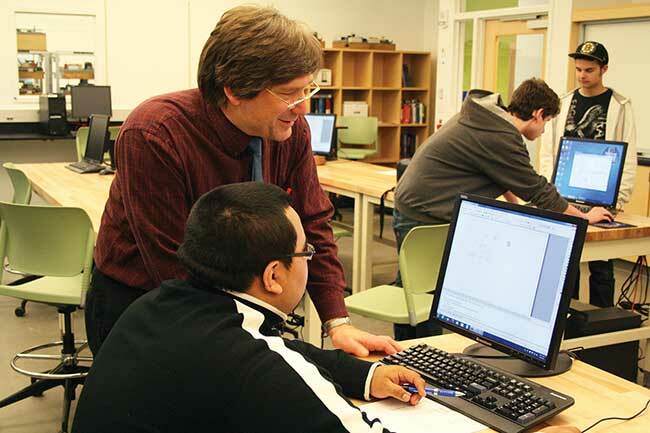 To get the new program going, the school has already received a Mentor-Connect grant — supported by funds from the National Science Foundation (NSF) that assist community colleges around the country to “develop programs to meet critical needs in technician education.” WCC also plans to apply for another NSF grant, for Advanced Technological Education, in the fall. According to Ioannou, the new program will be the first of its kind among community colleges in the region.